As 2009 sees arguably the most significant rewrite of the F1 technical rulebook in the history of the sport, the BMW Sauber F1.09 is practically a clean sheet design. Completely redefined aerodynamics, the return of slicks and the option of fitting KERS (Kinetic Energy Recovery System) technology have literally brought the teams back to the drawing board. During the course of 2007, the OWG (Overtaking Working Group) set out a plan to ease overtaking and decided that the best way to do this was reduce downforce. In order to have an acceptable overtaking difficulty, a car's total downforce had to be reduced by 40%. As a result, the front wing has grown in width from 1400 mm to 1800 mm, making it as broad as the car as a whole. Conversely, the rear wing's width was reduced to 750 mm and its maximum height increased. For Willy Rampf, the man responsible for the car's concept, and Walter Riedl, responsible for the development of the new car, this project has represented a memorable challenge. 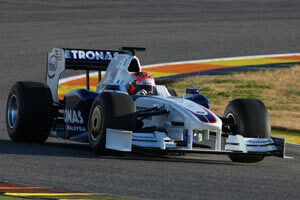 “Developing a new Formula One car is always exciting, but this time there was something even more special about it. We really were starting from scratch,” says Rampf. gives the front tyres proportionally a greater contact area and more grip than the rear tyres,” explains Rampf. Consequently, more weight has to be shifted towards the front of the car and the aero balance adjusted likewise. Compared to its competitors in the 2009 season, the BMW Sauber has fairly high sidepods that slope down towards the centre of the car. It is specifically shaped around the radiators to provide sufficient cooling for the engine, its ancilliaries and the KERS components. The sidepod still features small louvers close to the car's floor to form a hot air outlet, together with the rear end of the sidepod. The nose and front wing are fairly similar to most other cars, except the the front wing's panels are held up with a fence, rather than a simple aluminium linkage. Mechanically, the new car features a new front and rear suspension to make optimal use of the new slick tyres. Added to that, the gearbox casing - still produced in titanium - was revised but contains an almost identical internal component setup. Rampf and Riedl further mentioned that they have put a lot of attention to the design of the front wing. The team carefully simulated several alternatives with its 'Albert3' supercomputer before deciding and optimising the best design. Because of the total reduction in downforce, they also admitted that the new car will run with maximum downforce at a lot more circuits than in 2008. When looking back on its initial development phase, most of the work appears to have gone into the aerodynamics, the optimisation of tyre usage and the integration of KERS.